A Birthday Gift for AAAI Conference: Does AI Need a Reboot? This year marks the 25th anniversary of the Association for the Advancement of Artificial Intelligence (AAAI, formerly the American Association for Artificial Intelligence) Conference, which will be held on August 7-11 in San Francisco, California. AAAI is an important and strategic partner of the IEEE Intelligent Systems magazine, and our magazine will has its first editorial meeting in “physical space” for the last 5 years at the AAAI Conference. I hope our associate editors and advisors, and every conference participant an exciting time with a full taste of San Francisco’s colorful cultural and natural beauty! There is a timely “gift” for the 25th AAAI Conference: According to MIT’s Technology Review published on May 5, 2011, during a panel discussion that kicked off MIT's Brains, Minds, and Machines symposium, “Some of the founders and leading lights in the fields of artificial intelligence and cognitive science gave a harsh assessment” of “the lack of progress in AI over the last few decades”, and called “for a return to the style of research that marked the early years of the field, one driven more by curiosity rather than narrow applications.” Marvin Minsky, Patrick Winston, Noam Chomsky, Barbara Partee, Emilio Bizzi, Sydney Brenner, and others were presented at the workshop and offered their critique of “unthinkable machines” developed by AI and robotics so far. Both Chomsky and Partee emphasized that understanding human language was the key to creating genuinely thinking machines. Chomsky derided some machine learning researchers “who use purely statistical methods to produce behavior that mimics something in the world, but who don't try to understand the meaning of that behavior.” Brenner agreed and worried that researchers in both AI and neuroscience might be getting overwhelmed or become "overzealous" with surface details rather than seeking the bigger questions underneath, “they should refocus on higher level problems instead”, he said. You can find all kind of responses and comments to those pioneers’ harsh assessment of AI development on the web. As for my own, my immediate reaction was to think of Yogi Berra’s baseball: “this is like Déjà vu all over again.” Well, perhaps more than a repeation of the past. When China’s Science and Technology Review, a flagship magazine by the Chinese Association for Science and Technology, interviewed me for my idea to Technology Review’s report, and on whether AI needs a reboot, I told them that it seems that the debate had occurred some 30 years ago, and in Roger Schank’s term, it was called “neats vs. scruffies” (Vol. 29, No. 14, May 18). Actually, disputes between “neats” and “scruffies” have never stopped in the history of AI development, but this time there seems to be a reversal of roles taking place: with scruffies becoming neats and neats becoming scruffies. Of course, you can argue that it is different now, it is fundamental vs. applied or general vs. specific. For me, this is still the same head with different hats. About 25 years ago, I published a book review on “Logical Foundations of Artificial Intelligence” by Michael R. Genesereth and Nils J. Nilsson. I admit that at the time I was a faithful follower of “neats” and spent a significant amount of effort on logic and other formal methods in AI. After a few years of working experience with real intelligent systems for real-world problems, I come to the conclusion that the real and meaningful success of AI must rely on an integration of both “neats” and “scruffies”. As I have often told my students, I felt that my brain was with “neats”, but my heart went with “scruffies”. To me, the current assessment of AI development might be overly critical and too harsh. In the interview, I told Science and Technology Review an old Chinese saying: “Thirty years east of the river, thirty years west of the river”. Roughly speaking, the first 30 years of AI history was the age of “neats”, and the second 30 years was the era of “scruffies”. So if the Chinese wisdom gets it right this time, maybe, just maybe, it is the turn of “neats” again, but in what sense? Does AI need a reboot? Yes, but in cyberspace, not physical space. For me, the era of Internet and Web actually implies the coming of the golden age for AI research and development. The vast waves of Web data have flooded pass your doorway and is now lapping at your bedside, to prevent such information overload and return to the comfort of dry land, AI seems to be the only available approach. Thus, at this point it is urgent that we develop more effective data-driven methods in AI, rather than a rebook of AI. In my first letter of editor this year (see “Back to the Future: Surrogates, Mirror Worlds, and Parallel Universes”), I described my experience with movie Surrogates and the idea of creating software or web surrogates as new robots in cyberspace for assuming various societal activities and roles for humans, such as crawling beneath the internet—gathering information, making friends, social networking, organizing our life, improving our studies, and conducting our business. Ultimately, web surrogates will enhance our abilities, and make our lives and societies safer and more comfort, leading to a “smart world” and “smart lifestyle” at least in cyberspace. This should be a new and urgent direction for AI and robotics research. We need a quick and powerful start! As the Chair of the Local Arrangement Committee, and also on the behalf of the Executive Committee of the International Joint Conference on Artificial Intelligence, I would also like to take this opportunity to invite and welcome you all to join us in Beijing for IJCAI 2013 and its first International Summer School in AI in 2012 (for detailed information, check http://www.ijcai-2013.org). This will be the first time that China hosts the IJCAI since its bebut in 1969. I am confident that you will find your experience there interesting and rewarding. Back to IS magazine. 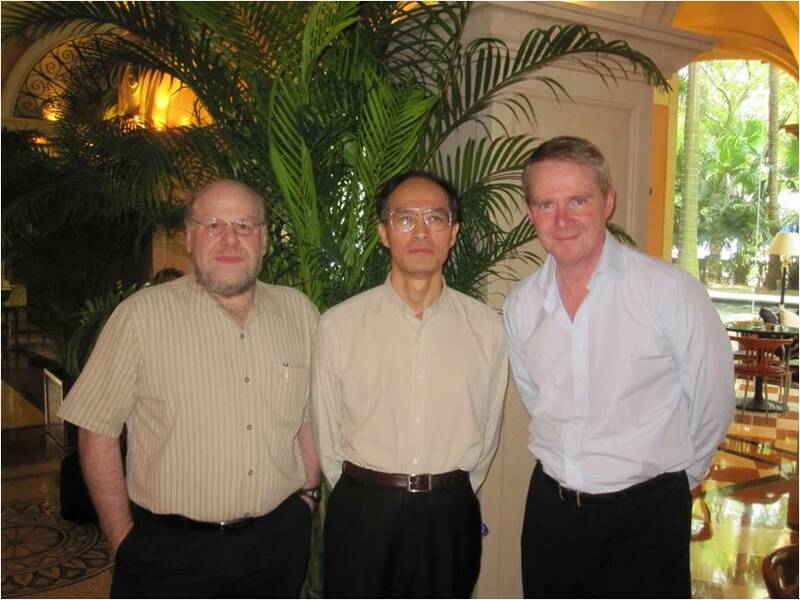 Last May I had a happy reunion with my two predecessors, Prof. Nigel Shadbolt (2001-2004) and Prof. Jim Hendler (2005-2008). We met at Shenzhen, China at the China-HK Joint Workshop on Web Science earlier in May. A few days later, at the IEEE International Conference on Robotics and Automation (ICRA 2011) in Shanghai, I had another reunion with many old and new friends, where I was invited to talk about agent technology and web surrogates in social computing, transportation, control and robotics. Last but not least, I would like to welcome Professor Hiroaki Kitano of Sony Computer Science Laboratories, Inc., and the President of IJCAI Board of Trustees as a new Associate Editor, and thank him for his willingness to serve our magazine with his great experience and leadership in AI.